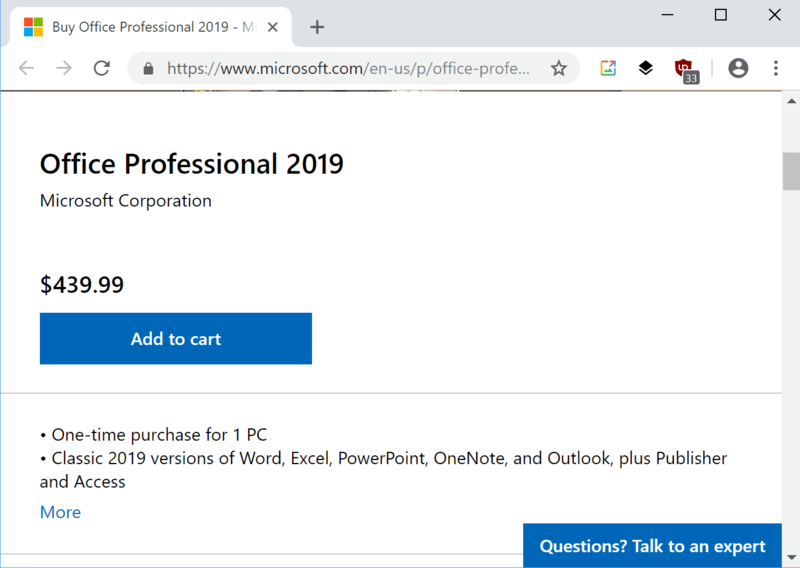 Customers get a copy of Microsoft Office 2019 Professional for the price that they may install on a single PC running Windows 10. Office 2019 Professional is only available for Windows 10 PCs. The professional version includes desktop version of the 2019 versions of Word, Excel, PowerPoint, OneNote, and Outlook, plus Publisher and Access, and is licensed for home and commercial use. The core difference between these two editions is that Outlook 2019 is included in Home & Business 2019 while it is not included in Home & Student 2019. Office 2019 Professional is only available for PCs that run Windows 10 whereas Home & Business 2019 and Home & Student 2019 are available for Windows 10 PCs and Macs. How does it compare to the 2016 editions of Microsoft Office? The price for Office Home & Student stayed the same as Office Home & Student 2016 retail price was set to $149 by Microsoft. The price of Office Home & Business 2019 increased by $20 when compared to the 2016 edition, and the price of Office 2019 Professional increased by $40 when compared to the 2016 version. Microsoft seems to have removed the 2016 version of Office from the company store. The only Office version for the desktop that is currently available on the Microsoft Store is Office 2019. Some versions of Office 2019 are already available on third-party Stores. Amazon lists Microsoft Office Home & Student and Microsoft Office Home & Business for the same prices as Microsoft does. Subscription-based versions of Office , called Office 365, start at about $70 per year for Office 365 Personal which includes Microsoft Word, Excel, PowerPoint, Outlook, Publisher and Excel. Office 365 Home is available for $99.99 currently. It includes access to the same applications but unlocks access to the Office applications for up to six users. Office 365 for business customers starts at $8.25 per month for Office 365 Business. Microsoft Office 2019 is only available for Windows 10 and the latest version of Mac OS X. Companies and individuals who run previous versions of Windows or Mac OS X can't install the new version officially and need to purchase the 2016 or even older versions of Office instead if they want to run desktop versions. While there are workarounds to get Office 2019 to install on previous versions of Windows, none are official. Microsoft revealed a moment ago how much money it charges customers who would like to get their hands on the company's new Office 2019 Professional. Eh… It will eventually appear in a few stores for 30$-40$ like it happened with Office 16 Professional Plus. No wonder hundreds of millions of people use cracked versions.. I have to admit – Windows 8 is the first version of Windows (or Office for that matter) that I have purchased since Windows NT Server v4.0. And they were bought at huge discounts. The average person doesn’t need anything newer than Office 2010. Me too. As far as I’m concerned, the ruined Office after the 2003 version. Because I love Access, I still use it. I also use Softmaker’s 2016 version. Very nice. Depending on where you work it’s worth keeping an eye on http://www.microsofthup.com. You may be able to buy it at a substantial discount as a home use version of the software you use at work. I’ve gotten the last two or three versions of Office that way. The price for Office 2019 Professional in Israel is $500. I’ll definitely buy it as it will be the last, probably longest supported, non-cloud version available. And I’ll buy it, similar to Windows 10 Pro, directly from Microsoft to avoid any future third party licensing confusions. I’ve made this mistake with Windows 7 Ultimate, Office 2010 Home and Business and the Adobe Creative Suite. I’m not going to be cheap on this again. Office 2019 support ends on the same day as support for Office 2016, in seven years instead of the expected ten years. How generous of them to raise the price by 10% while lower support by three years. This is why LibreOffice looks so good these days, for small business and consumers. They have already announced that it is not the last on-premises version and that they will keep doing perpetually licenses releases. Read the Office 2019 announcement or blog. You’re right in regards to LibreOffice. I use it too. You will be surprised how many people use legacy software including Microsoft Office (previous versions). There has to be a constant push to better technologies in order to become mainstream. You clearly don’t use Office tools professionally, there’s no third-party Office Software that can replace Office. As we need to keep compatibility with older documents, and third-party companies documents, while everyone uses Office. Even LibreOffice doesn’t support the entirety of Office features, and will break all of the complex documents companies use. Office’s few proprietary tools and network integration still doesn’t compel the average person to need Office. That’s strictly for businesses that buy into the entire Microsoft “ecosystem”. Emma, is that you? It’s ages since I’ve seen the “E” gurl! I hope you’re doing okay as I heard a lot of people got laid off at Redmond. You should come too – Redhat is awesome, although there’s not much demand for writing manuals these days. We’ll need to catch up some time – remember Office Assistant!! Them were the days. We don’t even use Office in my workplace, either. It’s LibreOffice all the way. I use Microsoft Office 2016 Pro only because each new release I can get it through my employer for $9.95. Not bad for ten bucks, so why not. I’ve been doing it for the last three releases, so I’m interested to see if 2018 will be the same. I’ve been using Libre Office since it first came out. 2011ish..? One more reason to switch to Libre Office. Does the job for most of us. Certainly not. MS Office does nothing that I need that I can’t get (often in a better way) from other solutions. Why Microsoft does not release a free version of Microsoft Office only with Word, Power Point and Excel? This is absolutely ludicrous. Office software shouldn’t cost as much as a new computer. Sounds like they’re taking a page from the assistive software book. Basically if you’re blind (as I am), you need either a screen reader or magnifier to use the computer. The magnifier built into Windows is good as long as you have a mouse (but it is a nightmare on a touch screen). The Narrator screen reader though, is a sad joke. Terrible terrible terrible. Anywho, an actual decent and usable screen reading program (like Jaws) or a screen magnification program (like ZoomText) generally costs as much as the average person’s computer does, just like this office software! There is NVDA (a free/open source screen reader for Windows that is actually quite good), but the state will only teach (and buy) Jaws. Apparently they really love price gouging monopolies! I should mention that Jaws is $900! Come to think of it $900 would get you at least two average-spec consumer oriented computers. The price of being blind (and ignorant of NVDA) is quite high! Short answer, no. LibreOffice is more than adequate for my needs. I still use Office 2010 – which I bought when I was a college student for $79 – if I remember correctly. It still works 8 years later. There is no way on earth that I am going to part with $439 for a version upgrade. I’ll stick with Office 2010 until the bitter end, and then hop over to OpenOffice. Looks like I’ll be sticking with Office 2016 for good. Besides, it’s not like there’s any real reason to upgrade. When 2016 support ends I might look into LibreOffice or even Google Docs. I LOVE This . . . and you will too! I don’t work for the company but I’ve been using their TextMaker program for a while and never had a problem with it and they are continually updating it. Maybe in english but since years catastrophic punctuation, typo etc in french, only Libre Office is irreproachable in other languages and accept extensions like Grammalecte. libreoffice on linux mint. a winning combination. why pay M$ when there’s a strong opensource community! I won’t be buying 2019 and I won’t be downloading and cracking it either. I don’t create elaborate documents and have never had an issue with Libre Office as some have reported. As deals go, free and up to date is not hard to accept. Add in the requirement for Win 10 and the proposition is just silly, while on the Mac, Apple’s software is free anyway. Not very good from what I hear, but still fine for the simple tasks I need it for. Here’s the thing, I liked Microsoft a lot better in 1999 than I do today so the less of it around me, the better. @Jozsef: In 1999 Microsoft was scared of being broken up into separate companies (OS, applications, hardware) by the US federal courts. They narrowly escaped a forced breakup and were subjected to oversight for anticompetitive behavior by the US Department of Justice until May 2011. Now they’re just mildly annoyed at how much it costs to keep European antitrust enforcement authorities in check. They behaved better when they were monitored and scared. Without bundling, tying, and vendor lock-in, there’s no way they could get away with *half* of the unpopular moves they’ve been pulling. I switched from MS Office to LibreOffice in Windows several years ago (and like it! ), and have been getting used to Linux Mint in a virtual machine for a couple of years (and like it!). So I’m like you: the less Microsoft around me, the better. That’s an excellent summary of the timeline. I remember back when Microsoft was a brand new upstart. They were a reasonable company then (imperfect, but not unusually misbehaving). Then they achieved market dominance and became a terrible company. Then the feds started coming down on them for being a terrible company and they became less terrible. Now they’re back to being terrible. @John Fenderson @Peterc Funnily enough, what MS was required to do was to designate an employee to monitor their compliance with the court’s orders and then self-report on their performance. Not too surprisingly, they deemed their own behavior exemplary and were finally relieved of that huge burden of oversight to become what they now are. Of course they did moderate their shenanigans to avoid the possibility of any real pain but they always had friends in high places so not too much sleep was lost in the Gates household, I would think. From what Longhorn promised to this is no small disappointment. Good for them! Nope, not unless the price drops drastically (it will) and our Office 2010 (3 licenses for $99) dies ( it won’t.) Otherwise Libre Office works great. Hmm, have we bought anything MS since Office 2010? Nope, our OS’s were either free upgrades or came with new devices. Software companies must be telling themselves cloud based stuff doesn’t depend on reliable, fast internet connections or they don’t mind periodically waiting for something to happen. What do business licenses cost, $1000 per seat? LOL! Will you buy Microsoft Office 2019? No, because it only runs on that spyware laden, dumpster fire known as Windose 10. Though I have Office 2016/2010 in VMs for vsto dev, 90% of the time I use the last great, the last rational version which was Office 2003. Plus, Access 2003 is 10x more usable than any later version and I prefer Onenote 2003 for it’s clearer, less fussy interface. Oh, and 2003 start up is lightening fast when compared to later versions; 2016 is a dog. PS: You can probably pick up Office 2003 on ebay for dirt cheap. If so, make sure to install Office 2003 SP3 and to block all Office exe’s at the win 7 firewall; I am certain Office 2003 is a huge security threat. If you run as admin, you also might want to run Office 2003 apps through dropmyrights & disable macros for extra security. Under its current framework agreement with Microsoft, Israel pays more than 100 million shekels ($27 million) a year for the procurement of Office desktop software, Windows and server software for ministries and government offices. According to the Finance Ministry, Microsoft is trying to shift Israel from a licensing system where it owns the software and can use the software as it wishes, to a subscription system that is similar to renting. The ministry noted that the change, which includes moving data to the cloud, does not meet the government’s needs. It said the state had been negotiating with Microsoft officials in Israel for a year to no avail. Israel plans to freeze the existing license structure owned by government ministries, which may be used without further payment. Microsoft in Israel declined to comment. I wonder how good and how big a LibreOffice development and support team you could hire for $27 million a year? What if every government in the world gave half of its MS Office budget to the Document Foundation for LibreOffice development and used the rest for local adaptation and support? What if “open document formats” were actually *open* and could be readily supported by *any* vendor? These would be interesting questions to put to government procurement officials. Israel could do what the Chinese did and create their own operating system (Linux based but looks like WinXP). Windows is a convenience, not a necessity. In fact, it was recently reported that Linux now dominates MS’s Azure cloud. When the return doesn’t justify the expense – dump the product. State security, in my opinion, is the major issue that Israel has with Microsoft (MS). Israel moving data to MS servers (cloud), would be the same as including Hamas (and others) in Israel’s internal computer network. MS forced updates, that can (usually) degrade or break functioning software is another barrier. I’ve read that MS eliminated their entire testing/quality department and rely on user feedback instead. Cost is important, but not if you are dead. I think Microsoft will lose business.